After losing a week to travel between Edinburgh, London and Cologne, Germany, episode two is now available! On this episode I sit down with my fave knitting guru, Kate Atherley, who was in London on a recent visit. We got together for a proper knit and natter, or stitch and b***h, and chatted about her latest book: The Knitter’s Dictionary: Knitting Know-How From A to Z. While chatting about the book we got into longer discussions about crochet, the language of knitting and why words are important, the important role of a tech editor in pattern writing - making this a longer-than-usual episode at just under an hour. We wrapped things up with a rapid-fire “Prosecco Power Round” where I put Kate on the spot with 10 random questions. It’s been an off week for me here at C&Q. But you know what? It’ll all be fine. Or at least, I hope it will if I keep telling myself that. One of the things that has been reassuring me that everything will be fine is that old “when something in your life is out of control, there’s usually one thing that’s doing okay”. I’m paraphrasing outrageously right now because I’m tired but while everything else has been going crazy my knitting has been keeping me sane. Isn’t that usually the way? And happily, this has resulted in my first finish for 2019 - and a Make Nine 2019 finish at that! These are the Brave at Heart mittens by Dianna Walla of Paper Tiger (you can find her as Cake & Vikings on Instagram). We were going as a family to the WB Studios Tour at Leavesden outside London this past weekend so I had set that as my deadline and I literally cast off in the lobby at the studio just before we went on our tour! The pattern is exceptionally well written and the charts were easy to follow. I’m particularly obsessed with the details on the thumbs. The patterning is exquisite and thoughtfully flows from hand to thumb seamlessly. I didn’t swatch and have small hands so the 2.25mm needle size ended up being okay for me, but I have to admit they’re a little snug. If I were going to knit any of the others in the collection or these ones again I’d probably size up to a 2.5mm. I haven’t blocked them yet though (I’m waiting on some mitten blockers I ordered) so they may stretch a little bit when I do that. Oh but the YARN! Let me tell you about this yumminess that is the Scylfing 4-ply by Triskelion Yarns! This is a beautiful blend of 75% British Bluefaced Leicester and 25% Gotland wool and it is divine. Toothy but soft, with a buttery halo. It was perfect for colourwork and I have a TON of it leftover. Major props to Anna at Wild & Woolly in Hackney from whom I bough the yarn and who suggested that if I was going to have leftovers that I pick something I’d be really pleased to knit something else with and she was totally right. It’s funny how Facebook pops up those reminders about what you were doing “on this day” a year, or two or five or even a decade ago. 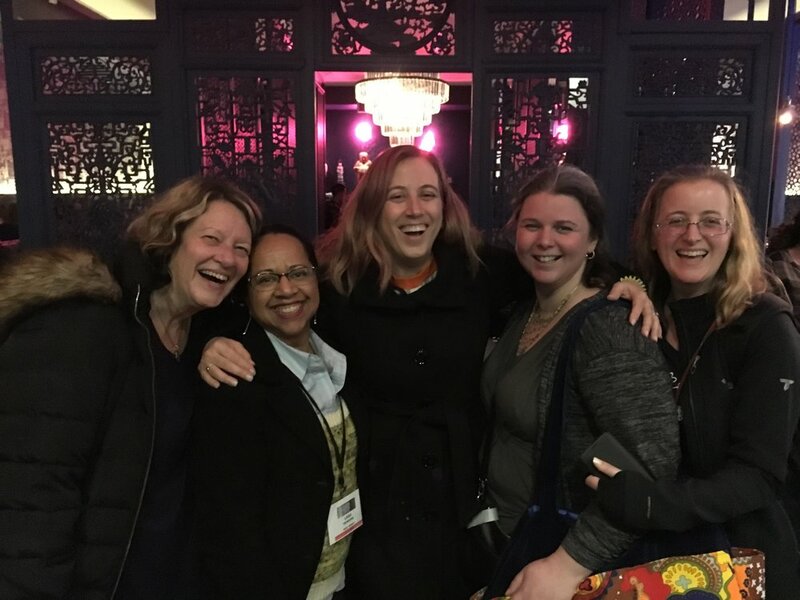 As I was reflecting on the past year the book of faces handily reminded me that this time last year I was in New York City for an amazing whirlwind visit to Vogue Knitting Live and a meet up with my Toronto stitchy gals. It was a very special way to kick off 2018 and what I think set the tone for a year of Yarn Adventures that Rachel and I chose as our theme for the year with Yarn in the City. For whatever reason, the moment didn’t make the cut on my Instagram, but looking at my Best Nine of 2018, there were definitely yarn adventures aplenty. My Best Nine 2018 clockwise from top left: Impressionists MKAL, meeting Andrea Mowry at EYF, Blue Lagoon on a Reykjavik stopover, hat design for Walcot Yarns, early morning flight to Barcelona, 100 year memorial since Armistice at the Tower of London, early morning flight to Dublin, Mon Manet sweater, Clara dress. Barcelona - a quick in and out to see the brand new Barcelona Knits festival, and great architecture too! And that doesn’t even include places like Farnham, Birmingham, Great Malvern, Builth Wells in Wales, or Skipton in Yorkshire for UK based yarn shows like Unravel, Stitches, Wonderwool or Yarndale. Looking back at all of it, and getting lost down the rabbit hole of my Photos application on the computer, I’m a filled not with regret about any of these visits, but that I’ve got away from posting about my adventures here when we first moved over. I was a much more diligent blogger in our early days in the UK and it’s something I’ve missed as the past few years have seen me do more writing for clients than myself. Writing in other people’s voices it’s going to take a while to rediscover my own. But back to the year that just was! Last year Ravelry introduced a “challenge” tab that you could access through your projects and use to set a goal for yourself. I didn’t even remember doing this but apparently I wanted to complete 10 projects and I ended up finishing 16. Woot! Perhaps even more fascinating to me was that only 3 of the 16 projects were WIPs from before 2018. Looking at the broken dreams that is my Ravelry project page, it looks like another 3 WIPs started in 2018 are still on the needles. 2018 was also the year that my yarn adventures extended into dipping a toe in the knitwear design waters. 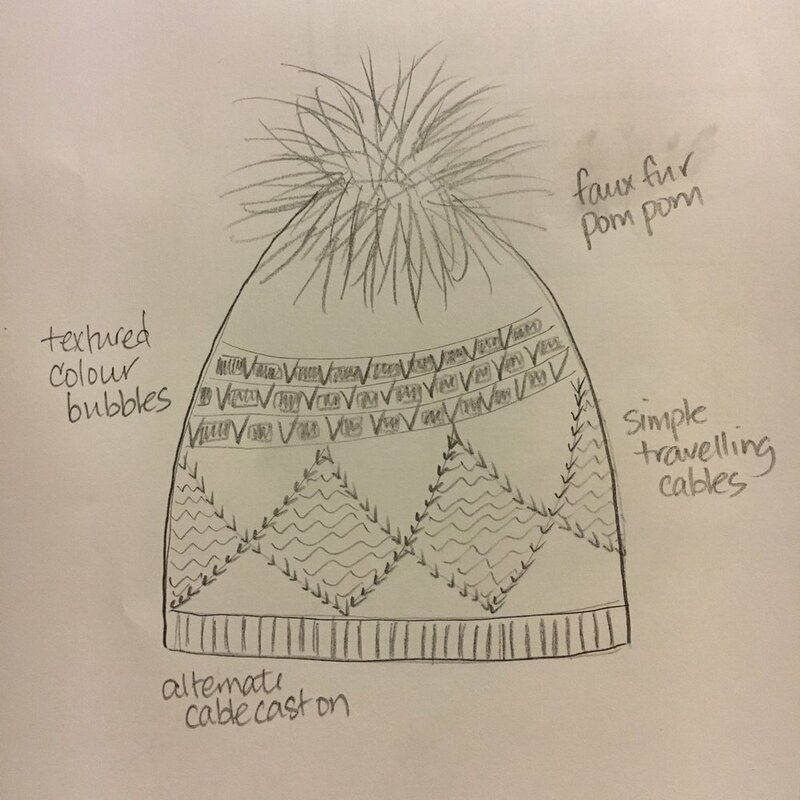 My first pattern to be accepted (and last to be published publicly) was the Folie Douce Toque for SweetGeorgia Yarns. Apparently hats were a theme as I also designed a hat for Walcot Yarns and a hat and cowl set for a new book from Yarn in the City. While small projects they were all great opportunities to learn more about knitting, designing, explaining things, and interpreting ideas. I’m hoping I can continue to explore this in 2019. The folks at the LoveKnitting photo booth took one look at my Union Jack cardi and handed me this hat prop. I swear! And of course I can’t forget things like finally getting to grips with my knitting machine, the 6th edition of the Great London Yarn Crawl or our second Yarnporium and working with and meeting amazing people in the knitting community! It’s fun to look back on the year that was and while I’ve enjoyed it and the touchstone that the end of year provides, I’m already looking forward to 2019 and what exciting new adventures - yarn-y or otherwise - that this new year will bring. Onward!